Erin McKeown’s output has continually wavered between exploiting her skills as a performer and arranger and her innate songwriting ability, sometimes using the former to hide cracks in the latter and the latter sometimes drowning out the former in its intensity. When her two selves work together, such as 2000’s Distillation or 2005’s We Will Become Like Birds, her wild genre fusion and multi-stylistic adventures morph into their own, mostly unclassifiable brand of song; her latest, Hundreds of Lions, continues her attempts to bridge those selves, and mostly succeeds. McKeown comes out swinging (literally, musically, lyrically) with “To a Hammer,” its Billy Joel-esque melody dancing over a staccato orchestral arrangement as she laments the metaphorical existence of a tormented relationship. Generally speaking, Richard Sherman-esque flourishes and folkie heartbreak musings are a recipe for disaster, but McKeown’s confidence keeps both working towards the same goal. Ditto the organ and electric guitar of “(Put the Fun Back In) The Funeral,” both giving additional heft to McKeown’s already mighty, restrained delivery. “Santa Cruz,” the album’s clear standout track, raises the stakes considerably, layering plucked strings beneath a fuzz-soaked burst of brilliant guitar pop, McKeown using her vocals not just as a means of delivery but as an instrument in its own right, turning the simple chorus of “don’t go” into a two-word anthem of its own. 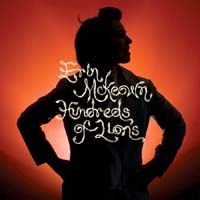 Wisely, McKeown turns down the bombast for “You, Sailor,” a quiet, somber meditation on claiming one’s place in the world; “I am a king,” she posits over a lone guitar and delicate xlyophone, “and you cannot deny me my kingdom.” The track works metaphorically, as McKeown’s tunes often do, but the simple guitar line absolutely soars once married to the song’s string arrangement coda. Whether the continual payoff of McKeown and producer Sam Kassirer’s decisions stems from the relatively long three-year recording period afforded by McKeown’s newfound independence (via release on genremate Ani DiFranco’s Righteous Babe Records) or simply the product of an already talented artist hitting her peak is probably a matter best unresolved, as the fusion of both seems to set up the parts for isolated failure; that the two intersected so marvelously on Hundreds of Lions should be cause enough for pop and folk fans alike to rejoice.